It makes light work of extreme summits like the Timmelsjoch, even in the harshest of conditions in the depths of winter. It slaves away in muddy excavations, and traverses sand and scree pistes in the farthest corners of the world. 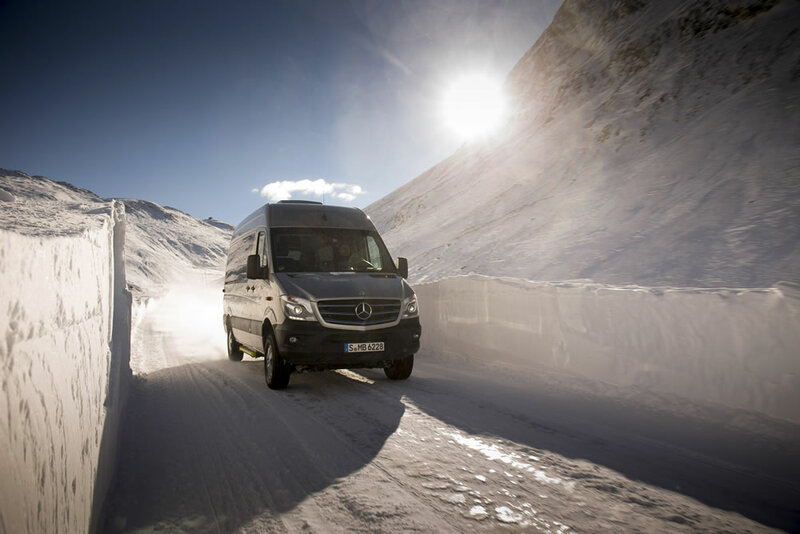 With all-wheel drive, the new Sprinter 4×4 is displaying its outstanding capabilities even under the most adverse of conditions. The undisputed number-one van with a GVW of around 3.5 t meets the strictest of requirements when it comes to traction. 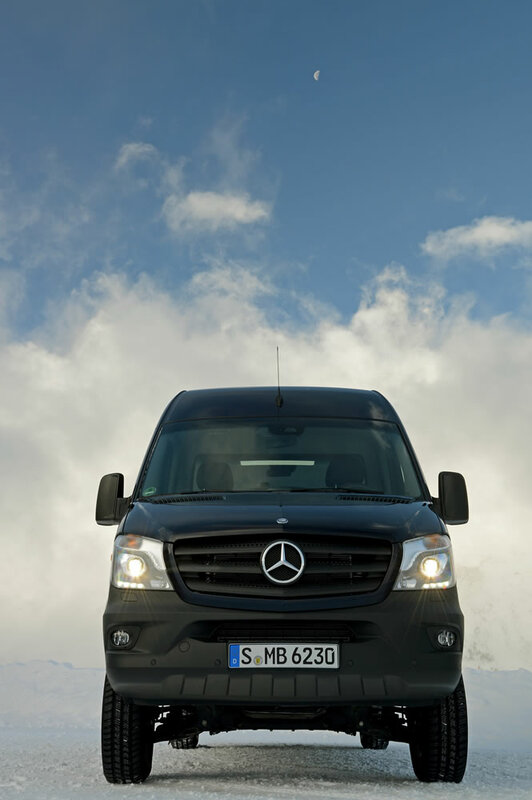 “Born to run.” – the Mercedes-Benz Vans brand claim describes the high-traction Sprinter 4×4 to a tee. When the going gets tough, the Sprinter gets going: the new Sprinter 4×4 provides that decisive extra traction under tough conditions. 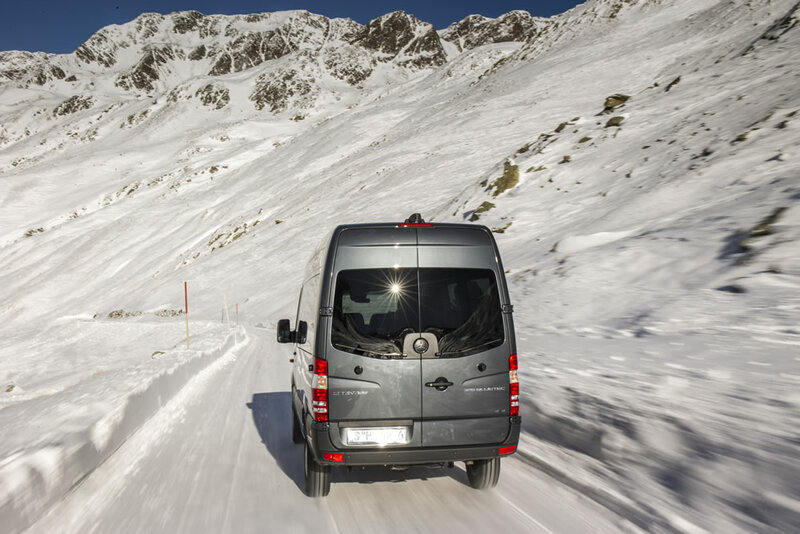 The Sprinter 4×4 crewbus is at home transporting hotel guests to snowy Alpine resorts while the panel van can convey work crews, materials and tools to wind turbines in wet fields. The crewcab can pull construction machinery out of pits, and the chassis with camper van body can take adventurers across rocky or sandy deserts. 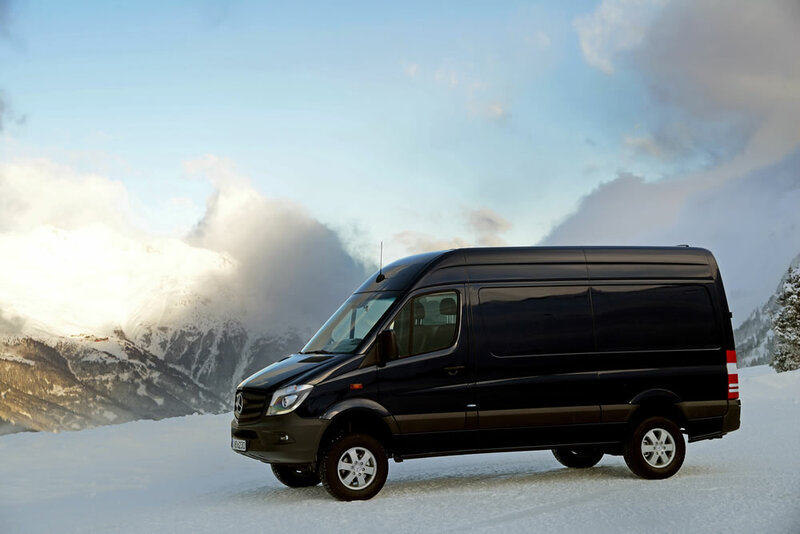 The Sprinter 4×4 is an all-wheel-drive van for professionals rather than the boulevard. Its home terrain? Construction sites, mountains, snowy regions and natural landscapes. And it covers an equally wide range of industries: construction, building materials, energy supply, forestry, the hotel business and, last but not least, people with a thirst for adventure. As a true professional, the Sprinter 4×4 makes life as easy as possible for its driver. Its all-wheel drive can be engaged at the press of a button, whereupon the 4ETS electronic traction system takes over. The driver simply needs to make well-judged use of accelerator and steering wheel while the technology takes care of the rest. The all-wheel drive is integrated into the standard-fit Electronic Stability Program ESP and complements the safety systems perfectly. The Sprinter 4×4 now comes with the option of Downhill Speed Regulation (DSR), which ensures that a preselected speed is maintained constantly when driving downhill. This is possible thanks to the interaction between the engine, transmission and specifically targeted brake actuation. DSR is activated using a button in the cockpit. The speed is then controlled using the stalk for the cruise control – the prerequisite for DSR. As a further option, Mercedes-Benz can equip the Sprinter 4×4 with Hill-Start Assist and off-road tyres with extremely deep tread. Plus the Sprinter 4×4 can be individualised by choosing from the familiar array of optional extras. 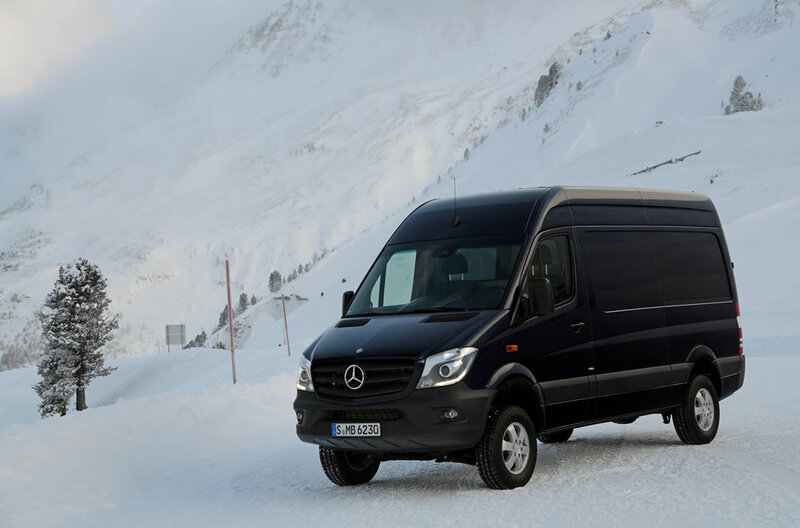 In keeping with the Sprinter 4×4 van’s areas of application, the all-wheel-drive system has a professional configuration based on the Mercedes-Benz 4ETS electronic traction system. This technology is also used in the Vito 4×4, Mercedes-Benz passenger cars, and the ML-Class and GL-Class off-roaders. In contrast to other models, however, the Sprinter’s all-wheel drive is engageable so as to cover the wide range of conditions under which the van has to operate. Furthermore, this technology minimises fuel consumption in everyday use. The all-wheel drive can be engaged when the engine is running, either when the vehicle is stationary or at low speeds of up to 10 km/h, using a switch on the instrument panel. In this case, an electric motor engages a pair of spur gears in the transfer case. An indicator lamp in the switch informs the driver that the all-wheel drive is engaged. In contrast to other systems of this type, the Sprinter’s engageable all-wheel drive does not provide a rigid through-drive. The power is transmitted variably, all the components of the standard-fit Adaptive ESP remain operational even when all-wheel drive is selected, and the acceleration skid control (ASR) is likewise activated. When all-wheel drive is engaged, the drive power of the Sprinter 4×4 is split 35:65 between the front and rear axles in normal operation, ensuring handling performance practically on a par with the Sprinter’s usual rear-wheel drive in everyday operation. The Sprinter 4×4 model’s all-wheel-drive system works with the electronic traction system 4ETS instead of with mechanical differential locks: should one or more of the wheels lose traction on slippery ground, 4ETS brakes the spinning wheels automatically with short pulses and, consequently, increases the drive torque at the wheels offering good traction by the same amount. To do this, 4ETS uses the ABS wheel sensors. Automatic brake application by means of 4ETS has the same effect as up to three differential locks: the interaxle lock, the rear axle lock and the front axle lock. The engineers have flange-mounted the transfer case directly onto the main transmission, while the front-axle drive has been kept very compact. It has a lifetime oil fill and, like the additional front-axle drive shafts, requires no maintenance. The additional “Low Range” reduction gear for off-road use, available as an option, further underlines the fact that the Sprinter 4×4 all-wheel-drive van is designed for professionals. Engaged at the push of a button with the vehicle stationary, the engine running, the 4×4 drive activated and the clutch pedal pressed, the ratio is shortened by a factor of 1.42, i.e. by 42 percent. The maximum vehicle speeds obtainable in the individual gears are reduced accordingly whilst traction is increased. 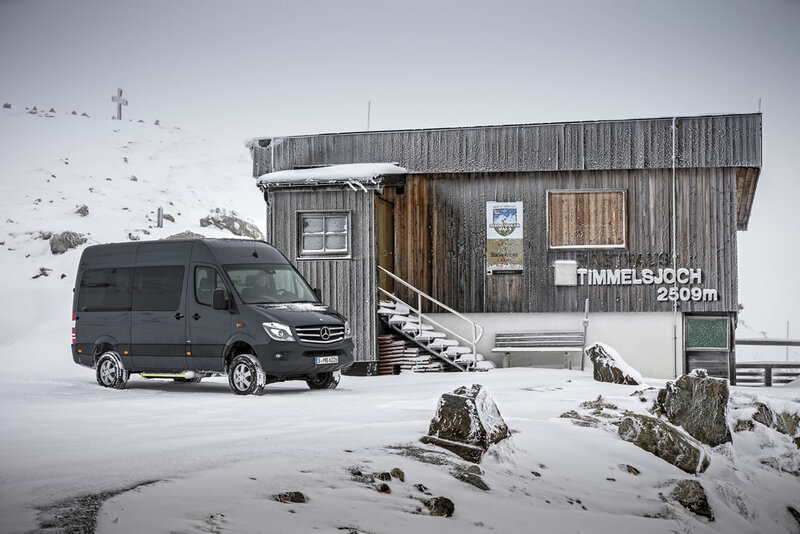 Now the Sprinter can be driven with anticipation at low speed in off-road conditions with sparing use of the clutch. The reduction gear comes in handy for reducing use of the clutch in case of frequent manoeuvring or where there is a high percentage of driving in mountainous regions and also in cases where the vehicle is often used with a full payload or for towing a trailer in off-road situations. The reduction gear is straight-cut, making it extremely robust to maximise mechanical loadability. If the Sprinter 4×4 is equipped with the optional Downhill Speed Regulation DSR, it is activated automatically when the reduction gear is engaged. Although the Sprinter 4×4 is not an off-roader, its raised body (by 110 mm at the front and by 80 mm at the rear) endows it with characteristics similar to those of a cross-country vehicle. By way of example, the approach angle of the Sprinter with a gross vehicle weight of 3.5 t is 28 degrees instead of 18 degrees in the conventional rear-wheel-drive Sprinter while, in the panel van with short overhang, the departure angle is 27 degrees (conventional drive: 22 degrees). The breakover angle – which is important for driving over humps – is 25 degrees in the standard-wheelbase Sprinter 4×4 instead of the usual 17 degrees. 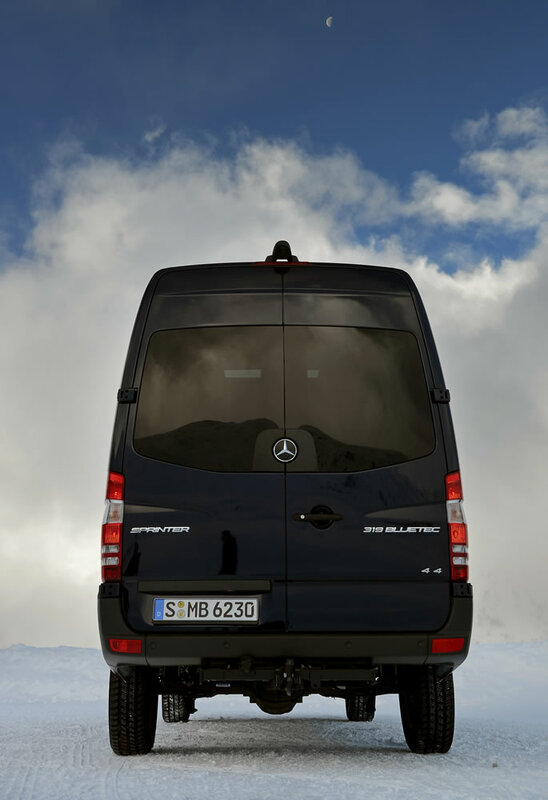 Depending on engine version, the slope climbing ability is around 20 percent higher than in the Sprinter with conventional drive. Equally impressive, at 610 mm, is the Sprinter 4×4’s fording depth (Sprinter 4×2: 500 mm). Because the body is raised, the familiar additional turn signal lamps in the exterior rear view mirrors would be above the maximum statutory height. For this reason, the Sprinter 4×4 is provided with side turn signal indicator lamps in the front side panels of the body. For the same reason, the panel van and crewbus versions have their rear fog lamp and rear reversing light integrated in the bumper. The Sprinter 4×4 also features a 100-litre fuel tank as standard. Grab handles for the driver and co-driver make it easier to get into the higher cab. Compared with the Sprinter with rear-wheel drive, the front and rear suspension setups include anti-roll bars or reinforced anti-roll bars. The additional weight of the all-wheel drive in the Sprinter 4×4 comes to just 115-135 kg depending on version. The comparatively low additional weight is attributable to the 4ETS system, which dispenses with the need for mechanical differential locks. 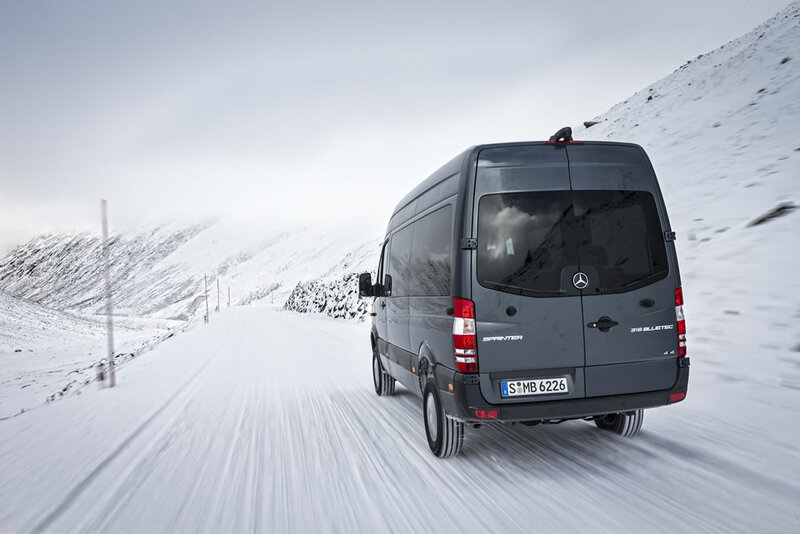 On the road, the Sprinter 4×4 impresses with its excellent control and perfect traction. It conveys an air of safety and effortless superiority typical of the brand as well as the same comfort as a Sprinter with conventional drive. The 4ETS traction control system is fully integrated in the Adaptive ESP Electronic Stability Program. Its control characteristics have been specially adapted to the all-wheel-drive system whilst retaining all of the functions of the Adaptive ESP: anti-lock braking system (ABS), acceleration skid control (ASR), electronic brake force distribution (EBD), Brake Assist (BAS) and the Start-off Assist system (AAS). One particularly important aspect for the many Sprinter body variants and attachments is the load and centre-of-gravity detection feature (Load Adaptive Control LAC). In the case of special-purpose bodies, for example, Adaptive ESP detects a high centre of gravity based on the vehicle’s movements and adapts the control characteristics accordingly. When driving off-road especially, Adaptive ESP therefore enhances safety, for instance when the vehicle is being driven along a steeply angled embankment. In combination with a factory-fitted trailer coupling, the system is completed by Trailer Stability Assist, which counteracts the oscillating movements of the trailer by means of selective application of the brakes on individual wheels. All-wheel drive and ESP interact perfectly: the vehicle/trailer combination is stabilised immediately and put back on track. Depending on the driving situation, it may be advisable to disengage the ASR acceleration skid control on the Sprinter 4×4, which can be done at the press of a button. This briefly raises the control thresholds so as to increase the traction by increasing the wheel slip, which is of advantage, for example, when snow chains are in use or when the vehicle is being driven on a gravel road. The ASR function is reactivated automatically at speeds between 40 and 60 km/h. The same is true if the wheel slip is impermissibly high or after more than ten seconds in ASR Off mode. ESP remains active in all situations. In any case, 4ETS stops critical driving situations from arising. As the vehicle speed increases, for example, the locking effect within an axle is reduced to prevent yaw (oscillation about the vertical axis) in the interests of driving stability. Despite such interventions, there is no possibility of the braking system overheating: if, under extreme off-road conditions, the temperature of the brakes rises to impermissibly high values, 4ETS automatically reduces the locking effect until the brakes have cooled down again. An indicator lamp makes the driver aware of this. The Sprinter 4×4 benefits from the same numerous innovations that have made the new Sprinter the undisputed innovation leader among vans in the 3.5 t category since its launch in the middle of the year. This means that the Sprinter 4×4 also features a new engine range that meets the requirements of the future Euro VI emissions standard. This is a major plus point for a van with all-wheel drive that often operates in environmentally sensitive areas. 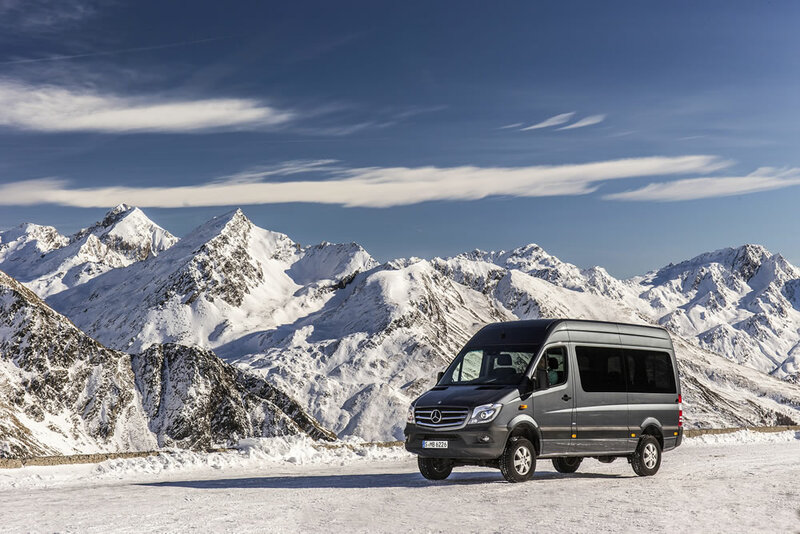 The Sprinter complies with the stringent limits by means of BlueTec engine technology and SCR technology with the injection of AdBlue into the exhaust gas. The product engineers have taken advantage of the additional exhaust gas aftertreatment to optimise the injection characteristics, the combustion process and the charge pressure. This has led to lower fuel consumption and quieter combustion. In addition, the drive and ancillary assemblies have been systematically trimmed to low consumption. Measures here cover the transmission, rear axle and intelligent alternator management, for example. The centrepiece of the diesel engine range for the Sprinter is the four-cylinder OM 651 with a displacement of 2.15 l. It has a bore of 83 mm and a long stroke of 99 mm for high pulling power – a major plus point when driving on demanding terrain especially. Charging is always by means of a two-stage exhaust gas turbocharger system. The peak torque is always available at low revs and across a wide engine speed range. 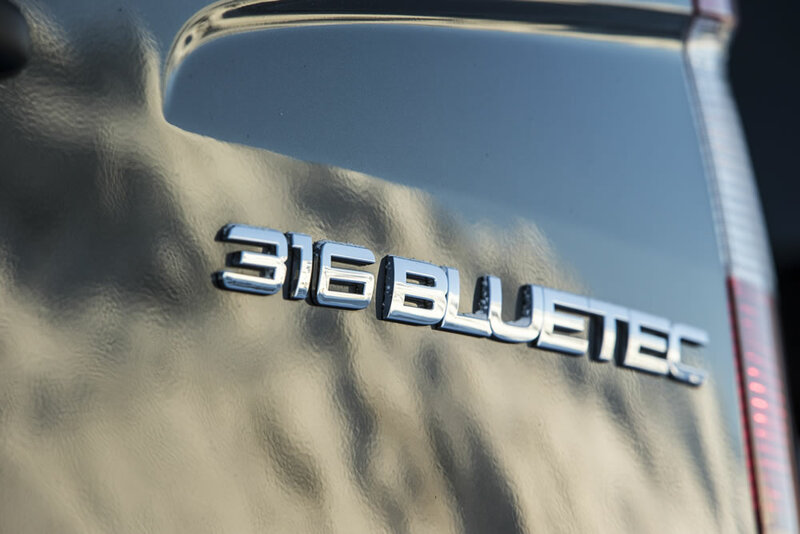 The combination of BlueTec engines with exhaust gas recirculation and two-stage cooling, SCR technology with AdBlue injection, and a particulate filter ensures clean exhaust gases. Sprinter 316/516 BlueTec 4×4 120 kW (163 hp) at 3800 rpm, torque 360 Nm at 1400-2400 rpm. Boasting identical output and torque data, the four-cylinder engine is also alternatively available as a Euro 5b+ version for open model variants and chassis versions of the Sprinter 4×4. In these cases, the SCR technology with AdBlue injection, the key feature for ensuring compliance with the Euro VI emissions standard, is omitted. If maximum power is required, the Sprinter 4×4 with the 3.0-litre V6 OM 642 engine is just the ticket. The long-stroke engine (bore x stroke: 83 x 92 mm) is based on an aluminium crankcase. An offset crank pin and a balancer shaft make for an exceptionally quiet-running engine. Technical highlights include four overhead camshafts. Sprinter 319/519 BlueTec 4×4 140 kW (190 hp) at 3800 rpm, torque 440 Nm at 1600-1800 rpm. As standard, all of the engine variants are paired with the Eco Gear six-speed manual transmission, which is now even more economical thanks to its wide ratio spread and the use of low-friction oil. As an alternative, the vehicle can be specified with a very easy-to-use five-speed automatic transmission with converter, which makes it easier to drive under difficult conditions as the driver is able to concentrate solely on steering, accelerating and braking. With an all-wheel-drive van like the Sprinter 4×4, the key aspect for performing demanding tasks is economy based on reliable traction. Nevertheless, the Sprinter 4×4 impresses with its low on-road fuel consumption. Fuel consumption in the panel van with four-cylinder Euro VI BlueTec engine registered as a truck is low: the combined figure according to NEDC for the Sprinter 316 BlueTec 4×4, for example, is just 8.3 l/100 km, while the Sprinter 313 BlueTec 4×4 consumes just 0.3 l/100 km more than this. This means that the figures are around 0.4 to 0.8 l/100 km higher than for the corresponding models with rear-wheel drive. Here it must be taken into account that the majority of variants have axle ratios that are around ten percent shorter to increase traction. In the case of the Sprinter 4×4 319 BlueTec, the combined fuel consumption of 9.8-9.9 l/100 km according to NEDC is almost identical to that of the rear-wheel-drive model. The Sprinter 4×4 has already played a special role as the 4ETS drive system is fully integrated into the Adaptive ESP Electronic Stability Program: all of the Adaptive ESP functions are retained even when the four-wheel drive is engaged. Furthermore, the new Sprinter 4×4 benefits from the five new assistance systems that were introduced together with the new Sprinter this year: Collision Prevention Assist, Blind Spot Assist, Highbeam Assist and Lane Keeping Assist are already available for the 4×4. Crosswind Assist will be introduced for the 4×4 in 2014. The new Sprinter 4×4 also benefits from the other exterior and interior modifications. These include a new, more upright radiator grille with arrow-shaped and perforated radiator louvres and the more sharply contoured headlamps. The new bonnet is higher and the bumper has a more eye-catching shape. Its elaborately produced underside is reminiscent of an SUV and harmonises perfectly with the characteristics of the Sprinter 4×4. The exemplary interior has also been further upgraded. New seat upholstery and covers enhance comfort, while the thick-rimmed steering wheel is easier to grip. The fresh air nozzles have chrome highlights if a multifunction steering wheel is specified. The knob on the shift lever has also been redesigned. The new radio generation gives the Sprinter not only sophisticated entertainment electronics with Bluetooth telephony including telephone keypad and phone book, but also the Becker Map Pilot navigation system. Typical for professional all-wheel drivers: to help ensure that every driver gets the Sprinter 4×4 they need, there are numerous variants of the van available. There is a choice of permissible GVW – 3.5 t or 5.0 t – with twin tyres on the rear axle in the case of the higher version. 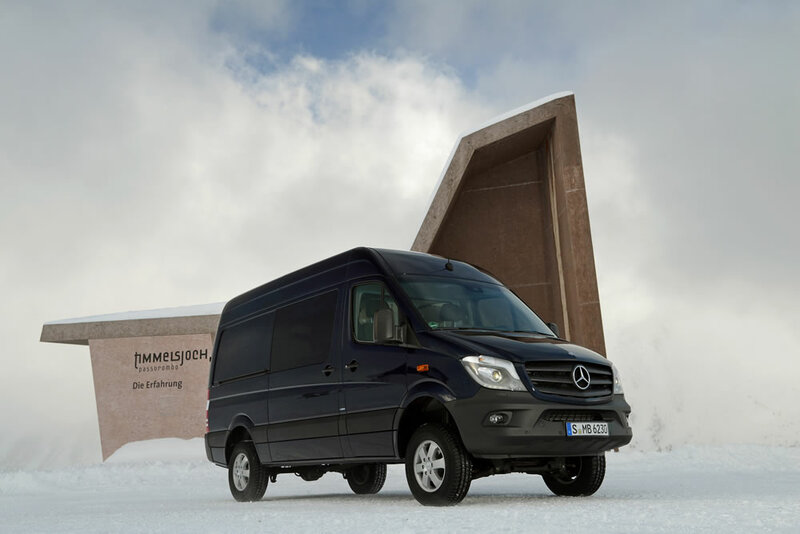 The Sprinter 4×4 is also available with either a medium or a long wheelbase, and with a normal roof, high roof or extra-high roof. The Sprinter 4×4 is available as a closed version in panel van or crewbus guise and as an open version in all the usual formats including the chassis units with single cab or crewcab. Given the possible combinations of engines, body variants and chassis units, lengths, permissible GVWs and drive system variants, the number of basic versions available runs into three figures. Each of these can be further individualised with a wealth of optional extras. In addition to this, the Sprinter is available with VanSolution special bodies in what are known as single-invoice transactions – as a tipper, for example – and with many other body and extension solutions from bodybuilders. In Germany, the extra cost of the 4×4 compared with the rear-wheel-drive Sprinter is €8391 (plus VAT). The reduction gear costs an extra €534. Standard equipment includes the Eco Gear six-speed manual transmission, while the proven five-speed automatic transmission with converter is available as an option. Although focussing on professional use naturally limits the Sprinter 4×4 sales figures, sales in the past year world-wide were well in excess of 2000 units. The main sales country is Germany, followed by Switzerland, Australia, Austria, France, the UK, the Netherlands and Finland. 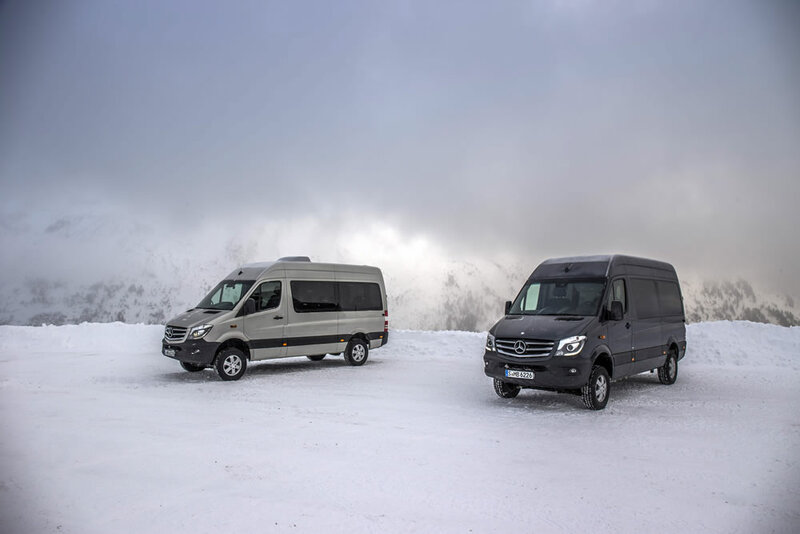 Expertise in all-wheel-drive systems at Mercedes-Benz Vans is not only concentrated on the Large Vans segment, but also extends to the Medium Van Segment. 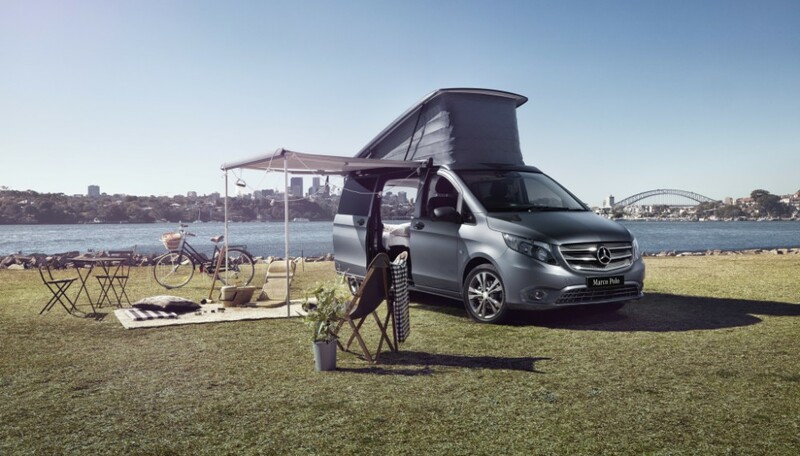 In cases where manoeuvrability is more important than load capacity, the all-wheel-drive Vito provides the ideal solution to your transport requirements. All Vito models are durable, resilient and reliable – none more so than the Vito 4×4 with all-wheel drive. When it comes to tough jobs, it is the van par excellence. Outstanding traction is coupled with an extremely easy-to-use permanent all-wheel-drive system. The conventional rear-wheel-drive system for the Mercedes-Benz Vito makes for excellent driving dynamics and handling. The Vito is renowned for its very agile and precise handling characteristics. And the Vito 4×4 enhances this reputation thanks to its traction with permanent all-wheel drive and, therefore, outstanding safety even under the most adverse of conditions. The Vito 4×4 makes life extremely easy for the driver, who just needs to accelerate as necessary and steer the vehicle. Everything else is controlled by the traction control. As is the case with the Sprinter 4×4, the all-wheel drive is based on Mercedes-Benz’s electronic traction system 4ETS. The main difference is that the Vito 4×4 has a permanent all-wheel-drive system. 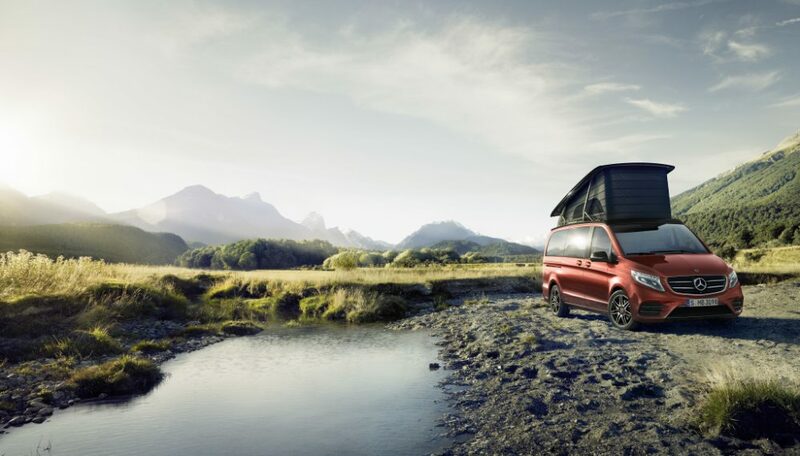 Although all-wheel drive does not transform the van into an off-roader, it does ensure maximum traction and, therefore, safety in tricky situations. In the case of the Vito 4×4 with permanent all-wheel drive, the drive power is split in the ratio 35:65 between the front and rear axles as for the Sprinter 4×4. Handling performance is therefore very much on a par with the Vito’s usual rear-wheel-drive system. The all-wheel-drive system works with the electronic traction system 4ETS instead of with mechanical differential locks: should one or more of the wheels lose traction on slippery ground, 4ETS brakes the spinning wheels automatically with short pulses and, consequently, increases the drive torque at the wheels offering good traction by the same amount. To do this, 4ETS uses the ABS wheel sensors. Automatic brake application by means of 4ETS can simulate the effect of up to three differential locks: the interaxle lock, the rear axle lock and the front axle lock. Like the Sprinter 4×4, the Vito 4×4 comes with the 4ETS traction system fully integrated into the Adaptive ESP Electronic Stability Program. Its control characteristics have been specially adapted to the all-wheel-drive system whilst retaining all of the functions of the Adaptive ESP. Although the Vito 4×4 is not a fully-fledged off-roader, it in no way shies away from off-road driving. Because of the higher body, the angle of approach is 20 degrees (conventional drive system: 14 degrees) and the angle of departure for the variant with short wheelbase and short overhang is 28 degrees (22 degrees) or 19 degrees (15 degrees) in the case of a long overhang. The breakover angle – important when driving over humps – is 19 degrees in the case of the Vito 4×4 with short wheelbase, instead of the usual 14 degrees. Ground clearance is 150 mm at the front axle and 210 mm at the rear axle. Slope climbing ability is around 20 percent higher than in the case of the Vito with conventional drive system, depending on the engine. The all-wheel-drive system in the Vito 4×4 adds only 80 kg of weight, meaning that the payload is only negligibly lower than that of the Vito with conventional drive system. The Vito 4×4 has a permissible GVW of 2800 or 3050 kg, depending on model variant. Since the all-wheel drive only increases the overall height by around 70 mm, depending on model, the Vito 4×4 is still below the important overall height limit of two metres. It is therefore low enough for low entrances, multi-storey car parks and automatic car washes – a key factor for unrestricted flexibility and everyday practicality. Clean and extremely economical with top performance: beneath the bonnet of the Mercedes-Benz Vito 4×4 lies the four-cylinder CDI engine from the OM 651 model series. The Vito 4×4 meets the requirements of the Euro 5b+ emissions standard. Its low fuel consumption reduces CO2 emissions. One of the key factors behind this is the BlueEfficiency technology, which is standard for the Vito crewbus registered as a passenger car and optional for the panel van. A common-rail system is used to inject the fuel. Both engine variants have a VNT turbocharger. As in the case of the Sprinter 4×4, combining a rated speed of 3800 rpm and a high torque available at low engine speeds results in a wide usable driving range between around 1500 and 4000 rpm. This is of particular benefit when driving off-road as the Vito 4×4 does not require many gear changes due to the engine’s characteristics. When driving off-road, changing gear results in a loss of traction. The BlueEfficiency technology specified as standard for the Vito crewbus registered as a passenger car (optional for all other models) reduces fuel consumption and emissions. Battery management, tyres with optimised rolling resistance, the Eco power steering pump, the controlled fuel pump and in-engine measures are proof that the Vito 4×4 is also very much state of the art. 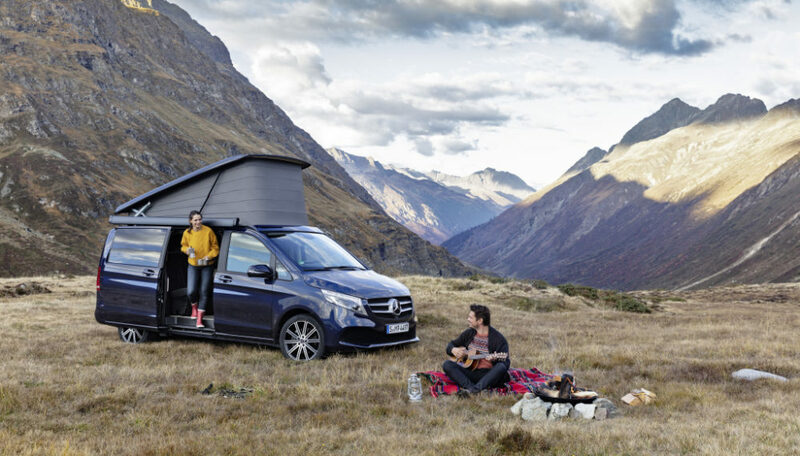 Standard equipment for the Vito 4×4 includes the exceptionally easy-to-use five-speed automatic transmission from Mercedes-Benz that has been tried and tested a million times over. The combination of 4ETS and automatic transmission is of immense benefit, especially when driving off-road, as the driver is left free to concentrate fully on what is happening outside. Mercedes-Benz offers numerous Vito 4×4 variants covering an extremely wide range of applications in the commercial sector. All three Vito 4×4 length variants – “compact”, “long” and “extra-long” – are available in conjunction with a flat roof. It is available as a panel van, including the Effect and Worker panel van model variants, as a flexible Mixto with a second row of seats, including the Worker Mixto model variant, and as an exceptionally versatile crewbus, including the Crew and Shuttle crewbus model variants. All-wheel drive adds €3256 to the price of the Vito, the automatic transmission €286. This gives a basic price of €31,797 for the Vito 113 CDI 4×4 panel van on the price list. The crewbus costs €34,167 (net list price in Germany plus VAT in each case).